If you’re in business, you already understand the importance of networking. People like to do business with people they know, and the only way to get to know them is to network. But oftentimes, a networking event ends up being a dull affair where people simply try to make small talk with strangers or try to sell them something before their attention wanes. Not exactly the best way to market your business, is it? But networking doesn’t have to be a painful and unproductive experience. If you get creative in your efforts, you can increase communication and cause the people around you to become more engaged. Here are 5 creative ways to make your networking efforts and events more successful. At most events, the sponsors will ask attendees to write their name on a stick-on name tag in an effort to make meeting people easier. But you don’t have to limit your tag to only your name. The number one goal you should have at a networking function is to get people talking, so why not use your name tag as a conversation starter? For example, just underneath your name, make a statement about yourself that’s unique, write your goal on the tag, or what you best offer to your customers. When people look at your name, they will instantly have something to talk about. And if you’re running the event, ask attendees to write something on their tags that will get conversations flowing. In order to get attendees to join together in a common goal, which will allow everyone to make connections, create a shared space where they can talk about their experiences, goals, and future plans. People love to talk about themselves, and if you can create a safe space for them to open up and share, you’ll not only encourage communication but also help event attendees to form bonds and business connections. In you’re not running the event, pull out a pad and a few pens, create a space right there, and then ask people to join you. 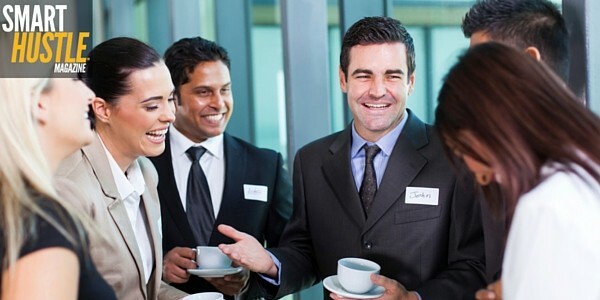 Don't let your next #networking event be boring. Check out 5 creative ways to spice things up. The most successful people at networking events don’t just view interactions as a one-time thing. Instead, they make follow-up plans with the people they meet. They may find they share an interest in something outside of work and make plans to attend a related event together, or they may discover ways their businesses could benefit each other. But many people aren’t that bold and end up leaving the function with a few handshakes or promises to call. One creative way to ensure the connections forged at the networking event continue is to set up after event groups. You can assign any purpose to these groups, such as asking them to come up with plans for the next event, talk about the things learned at the present event, or throw an invitation-only party for the attendees and their guests. Again, if you’re not in charge of the event, there’s no reason you can’t make plans with other attendees to meet again for some purpose. Most business people are competitive and can’t resist a challenge, so a great way to add some spark to a networking event is to create a contest. Whatever you do, make sure it gets people involved in a fun and entertaining way so they can really get to know each other. For example, many business owners rely on social media in their businesses, so why not use the platforms to create a little excitement? You can have the attendees post pictures from the event and ask their followers to like them. Then you can offer the people who get the most “likes” a special prize. You can use this idea, or get creative and come up with another contest that suits your event. You’ve heard of speed-dating, haven’t you? People are paired with a potential date for a very brief amount of time and have to make use of that time to get to know each other and determine whether or not they want to go on a date. The same concept could easily work in a networking event because just about everyone there is looking to make a business connection. It will allow people the chance to talk to as many people as they can about their business in order to find a match. Set up tables for two, and then assign attendees potential connections. Then time each interaction, and when the bell goes off, they have to move on to the next possible connection. This would be a fun, interactive way to get people talking, and allow them to quickly discover if there are any possible business connections in the room. Networking events don’t have to be boring events that people dread. Instead, with a little planning and forethought, you can make great connections that could lead to your next big deal.